AstroCel III is classified H12 or H13 in accordance with EN1822. 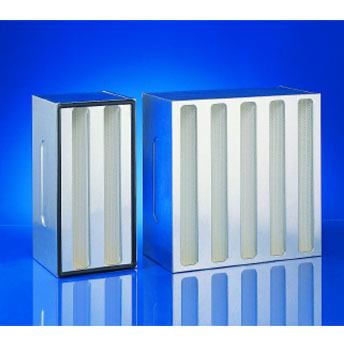 The filter displays excellent efficiency on fine particulate matters and is designed for use in high air volume applications up to 4000 m³/h. Due to its high capacity the filter offers several benefits. In new installations, fewer filters are required to handle the same volume of air required to handle the same volume of air compared to HEPA filters of the same size with a lower capacity. As a result, less installation space is required and installation time is significantly reduced. In existing installations, the filter's high media area ensures a low pressure drop which reduces energy cost. Contact us at SHAMON for more information on this product range. Particulate matter includes dust, smoke, pollen, animal dander, tobacco smoke, particles generated from combustion appliances such as cooking stoves, and particles associated with tiny organisms such as dust mites, molds, bacteria, and viruses. Gaseous pollutants come from combustion processes. Sources include gas cooking stoves, vehicle exhaust, and tobacco smoke. They also come from building materials, furnishings, and the use of products such as adhesives, paints, varnishes, cleaning products, and pesticides. Christchurch Civic Building - 11,500sqm seismic rated access flooring. © 2014 Shamon Air & Filtration. All Rights Reserved.